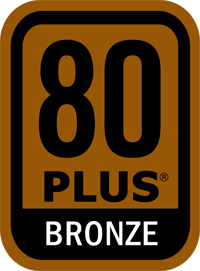 The Rosewill HIVE-550S is a premium 80 PLUS BRONZE certified power supply that delivers unprecedented performance, uncompromised features with unbeatable efficiency vital to today's high-end system. HIVE's black coated casing and rock touch finishing evokes a sense of high quality. It features active PFC with auto AC-input voltage adjustment (100 – 240V), mesh sleeves on all cables for easier cable routing and better ventilation, and one 135mm fan with auto fan speed control for efficient, silent cooling. Modular cable design helps reduce bulk and clutter inside chassis. An array of safety & EMI approval including UL, FCC, CE, CB and RoHS ensures outstanding reliability, durability and eco-friendliness.